Display boards are populated by 'stats collection points' which can be placed anywhere in your directory. Their placement determines the scope of the statistics which they collect. 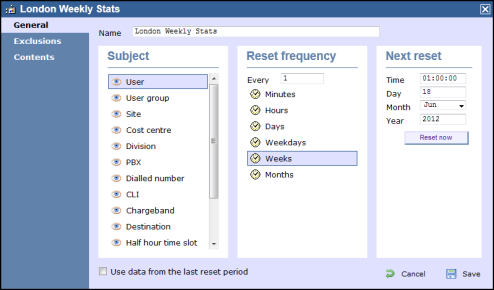 For example, you could place a stats collector inside a site, group or even an individual user. Alternatively you may want to select what you want the subject of the statistics to be. The subjects you can choose from include users, user groups, channels, channel groups, dialled number, CLI, chargeband, destination, half-hour time slot and account code. To save on resources, you can also select the call types you want to exclude from any stats point. These can be set to automatically refresh at predetermined times e.g. Daily at 08:00, weekly starting on 01/09/2012 and every week thereafter, or monthly starting on 01/01/2019. You may have more than one stats point at any point in your directory e.g. If you wanted to collect both daily and weekly stats for any particular team. Click on the video link above to see how Stats Points are added and populated. TIM Enterprise includes a number of templates that allow you to create display boards in seconds. This is the simplest way for new users to see how quickly and easily they can see their call stats. You simply scroll through the templates provided, select the one you'd like to use and then add a stats point to determine what's actually displayed. You can edit the template by changing the properties of any panel. You can also change the design, colour, font size and background. Once a display board is created, it is available as a template and can be used to display results for another site or team. You simply select the existing board you'd like to use as a template and then add a stats point to determine what's actually displayed. This is ideal for users who have spent time and effort creating a bespoke board with their own logo's, colours etc. You can edit the board by changing the properties of any panel. You can also change the design, colour, font size and background.